It’s officially summer. Let the beach fun begin. 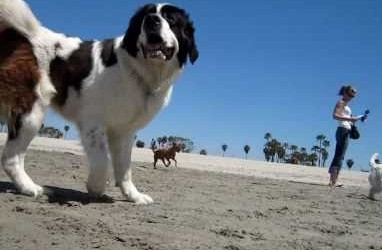 If you’re a dog looking for leashless freedom and frolic, there’s only one place in Los Angeles County to go: Rosie’s Beach. The 2.9-acre zone was established in 2003 and named “Rosie’s Beach” in 2010 in honor of Rosie the Bulldog, who inspired its creation. Justin Rudd, the founder of The Haute Dog (prounounced “hot”), pushed for the creation of the beach on behalf of his two bulldogs, Rosie and Riley. If you do bring your dog here, remember that at the end of your visit you will have a wet, salty and sandy dog, so be prepared. 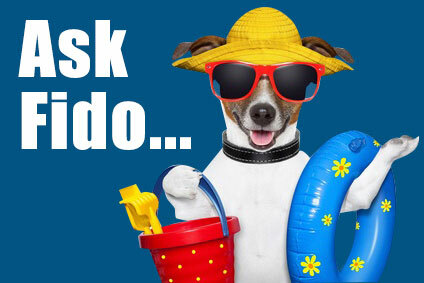 Dogs that run and play in the surf or chase toys will ingest a lot of salt water. Be sure you bring plenty of fresh water for them to drink. Salt water can also make some dogs nauseous. After your romp in the surf, take a break at Chuck’s “Home of the Weasel,” a tiny coffee shop. There’s even a groomer next door if you want to take your dog home clean. And the Weasel? That’s two scrambled eggs smothered in Chuck’s famous chili and topped with chopped onions and shredded cheese. Bring Tums. Keep your eye out for special events that are scheduled at the beach such as So Cal Corgi Beach Day. Location: Along Oean Boulevard between Roycroft and Argonne avenues. Metered parking is available in a lot at Bennett Avenue. This is actually closest to the dog beach area. Be sure to bring lots and lots of quarters. Hours: Daily from 6 an, to 8 p.m. except during special events or during poor beach conditions. Note that in the afternoons, wind blows sand inland. Dining options: Chuck’s Coffee Shop, 4120 E. Ocean Blvd., Long Beach, CA 90803. Telephone: (562) 433-9317. Casual dining at bargain prices from 630 a.m. to 2:30 p.m.. No credit cards accepted. Outdoor patio for patrons with dogs. All the normal rules of a dog park apply — pick up your pooch’s poop, don’t leave your dog unsupervised and be sure your dog is legal in terms of licensing and shots. Rub-a-dub-dub. Scrub your dog in a tub.